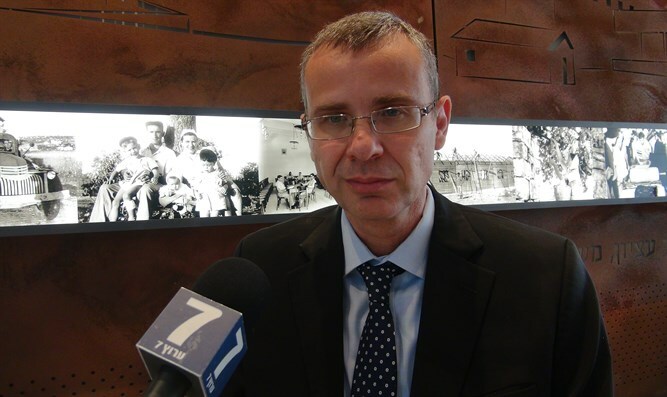 Tourism Minister Yariv Levin blamed the Supreme Court and Arab Knesset members for the terror attack in Umm Al-Hiran. Tourism Minister Yariv Levin responded to the terrorist ramming murder Wednesday morning in the Bedouin village of Umm Al-Hiran and to the rampaging by Bedouins during the course of the demolition of illegal houses in the village. In the attack a 34-year-old policeman, Erez Levi Hy'd (may G-d avenge his blood) was murdered and another policeman was moderately wounded. "The Arab Knesset members have a major responsibility for fomenting tensions and creating a situation where the norms are to encourage actions against the state and in violation of law," said Levin. He added that "a heavy share of responsibility for the present situation rests on the Supreme Court's shoulders. This is the same Supreme Court which enabled Zoabi and Ghattas to sit in the Knesset, the same court which allowed the Joint Arab List to compete for election in flagrant violation of the law, the same Supreme Court which instead of ruling that real enforcement should take place on illegal Bedouin construction allowed - time after time - postponements of demolitions while at the same time showing excessive strictness with any Jewish construction. We are paying the price for this today. "I send condolences and participate in the sorrow of the family of Erez Levi who was murdered this morning in Umm Al-Hiran," added Levin. "Today it was proved how essential was the decision which I initiated conditioning the transfer of funds to the Bedouin sector on their removing illegal construction and returning stolen lands to the state." "This is an unprecedented case which has not occurred before regarding the rule of the law in Israel. What is required is to immediately implement all of the demolition orders issued for illegal buildings in Umm Al-Hiran." The minister rejected the analogy between the Bedouins in the Negev and the residents of Amona, calling it "shameful and outrageous", since "in Amona just like in Gush Katif and Northern Samaria, people are sitting with state permission and assistance and every evacuation is accomplished without murderous and hateful violence towards the state like we saw today." Police raided the house of the terrorist who perpetrated the attack. In the course of their search they found three copies of newspapers which described a ramming attack in Hevron and an attack by ISIS as well as books in Arabic which were sent to professionals for investigation. Ariel has been charged by the government with finding a solution to the problem of rampant illegal construction in the Bedouin sector and the existence of dozens of unauthorized Bedouin settlements. The Minister slammed the involvement of Arab MKs from the Joint List party and other outside elements who encouraged residents of Umm Al-Hiran to turn down alternative sites to build on. “They’ve made their arguments in court, and even brought it to the district court and the Supreme Court,” said Ariel, adding that the appeals had been dismissed and the case closed.